Think of a Forum as a room containing related discussions around Friends Group issues. We have two “rooms” or Forums: Current and Archives. Within each Forum are various Topics of conversation. 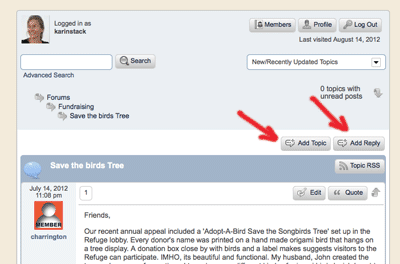 To add a reply to an existing topic, or to add a new topic, click the appropriate button in the white bar above the Topic name. New and active conversations are kept in the Current forum. If we see the conversation wane after a few months we move the topic to the Archives forum. You can still reply to Archived topics (and if the discussion picks up, we will move it back to the Current forum). Should you need to let someone know about a problem contact Joan Patterson.